So begins H. G. Wells' classic novel in which Martian lifeforms take over planet Earth. As the Martians emerge, they construct giant killing machines - armed with heatrays - that are impervious to attack. Advancing upon London they destroy everything in their path. Everything, except the few humans they collect in metal traps. Victorian England is a place in which the steam engine is state-of-the-art technology and powered flight is just a dream. Mankind is helpless against the killing machines from Mars, and soon the survivors are left living in a new stone age. The War of the Worlds is one of the first science fiction novels about alien invasion. It is even considered as the one of the classic science fiction novels. To be honest, I didn’t expect to like this book because I’ve watched the movie adaptation which starred Tom Cruise and I don’t like it. I got bored. So I didn’t have any expectation from this book at all. I only picked it up because it is the classic science fiction novel. As it turns out, this book is more fascinating than what I anticipated. The War of the Worlds is a story about alien invasion told from the perspective of an everyman. Most of the main characters in this book, including the narrator, are just ordinary people and they don’t have name. That is why I called the narrator earlier as an everyman. He’s an ordinary man, a writer, who manages to survive an alien invasion. Perhaps the nameless characters are intentional; to make the readers put themselves in the characters shoes. One thing that I think is fascinating is the setting of this book. The modernized movie version of this book is so ingrained in my brain that I forgot that this book is actually written hundred years ago. I was surprised when I found out that this book is set in the Victorian English. Imagine the contrast between the futuristic alien technology and what the English people have at that time. I’m amazed that Wells even thought about alien invasion in his time. I can see why this book becomes a classic. It’s definitely way ahead of its time. What makes this book different from other invasion novels (besides the fact that it’s the first in its genre) is this book doesn’t depict the heroism of humanity. It doesn’t tell the bravery of humanity trying to defend earth from alien. Instead, this book shows what a mess and useless when we are in fear. 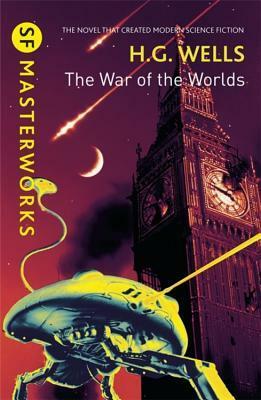 Although it is titled the War of the Worlds, considering how powerless human is in this book, calling it a war is not exactly right. At some point in the book, one of the characters even compared alien and human as man and ants. All in all, I think the War of the Worlds is a must read book for true science fiction lovers. I recommend this book to those who love science fiction or maybe those who want to start reading science fiction. You can start with the classic. It never was a war, any more than there's war between man and ants. Share book reviews and ratings with Istiningdyah, and even join a book club on Goodreads. Istiningdyah has read 5 books toward her goal of 35 books.